Dive Journal: The next day takes us to Northwest Wall, one of the most northern named dive sites off Salt Cay. This is John’s FIRST sport dive! And I get to be his buddy! Linda reminds me to watch him “like white on rice.” It is announced to those on hand that John is the newest PADI certified diver, and all the divers give John a round of applause. I enter the water before John and wait for him on the surface. John’s rented BC doesn’t fit him too well, and he has some trouble on the boat getting things latched up. During our descent, I notice his tank floating up at an odd angle off his back – the BC simply cannot be tightened enough around him. His straps are also all cross matched and twisted, and so we do a bit of surgery in about 10 feet of water. The descent brings a slow clearing of John’s ears, too. But I like the way John is cool and persistent in getting the job done, gestering me calmly to wait, perhaps ascend a bit, so that he can equalize. 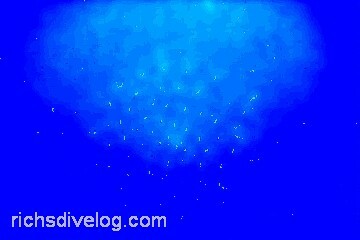 We eventually reach the reef wall top around 50 feet, while the other divers explore the reef wall below us. We examine a nice smooth trunkfish and a number of groupers hanging out in cleaning stations. There are great stands of ferny gorgonians everywhere, making the bottom look like a forest floor. We also swim around a big mixed school of chub and horse-eye jacks. Just after the turnaround, as I watch him, John’s eyes suddenly get wide, and he reaches out for his right hand, holding it out with stiffened fingers. It’s apparent John has just gotten stung by something, but I can’t see anything in the water that might have done it. John gives me the sign that he wants to surface, but we converse, through hand signals, while I assess his actual condition. Surfacing here would accomplish little, except to create a 100 yard surface swim for us back to the boat. It will be much easier to fin underwater. John is swimming fine, seems to be only marginally in pain, and is showing relative calmness. We hand signal that we will plan to follow the other divers generally back to the boat area, and then surface. While we swim back, I watch John very closely for signs of any nervous system effect, which could be possible from the wrong type of nematocyst sting, and we check his air consumption extra frequently. John does very well once again, as he completes the 10 minute swim back to the boat, and we then surface early. John explains that he saw a “string” of transparent round or oval things that stung him, only a couple inches long, floating in the water, some kind of jellyfish relative. John receives a coat of vinegar on his hand back at the dive shop, and the pain quickly subsides, to the relief of all. We reason that it is possible John is slightly more sensitive to stings than the rest of us old farts. However, Debbie received a similar mild sting a couple days later.